This site shows what happens when the "Chosen People" choose pork. North Carolina pork barbecue to be specific. Restaurant reviews and other posts are added to the main page. The tabs at the top of the page link to more barbecue content. While Triangle residents have battled against digital billboards, the Charlotte-area now has a slighly more interactive kind of roadside sign: A scented one. 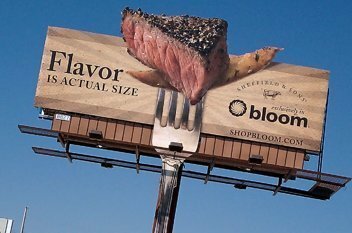 Drivers in Mooresville, near Charlotte, are currently getting a whiff of hickory and steak, thanks to a Bloom supermarket billboard promoting a new kind of beef. With fans wafting its aromas 30 to 50 yards down to the roadside, sign maker ScentAir Technologies just might be onto something. The news has even gone national and international. Of course, they have the wrong kind of meat. We here at BBQ Jew can’t help wondering what it would look like if this technology were applied to the sacred swine. For instance, as cars approached the hypothetical NC Barbecue Museum, a scented sign could signal your arrival. Then again, we’re prone to think that real wood-smoked barbecue needs no aromatic assistance. But, I’d enjoy having a ‘cue scent piped into my home (you can keep the billboard). And I’d even settle for barbecue poutpourri. And yes, this post’s title is our first, but hopefully not last, Skynyrd reference. I’m a huge “Q” fan. There is nothing like it. I look forward to hearing more barbecue news from your site. I have not been to Charlotte in a while but I am familiar with the area. I will have to check out the aroma around this town the next time through.